Get ready for Day Three of LC’s Online Week! Remember to keep checking back all week long, for new discounts, exclusives, and specials each day! For today’s special, we’re doing something that we have NEVER DONE BEFORE! 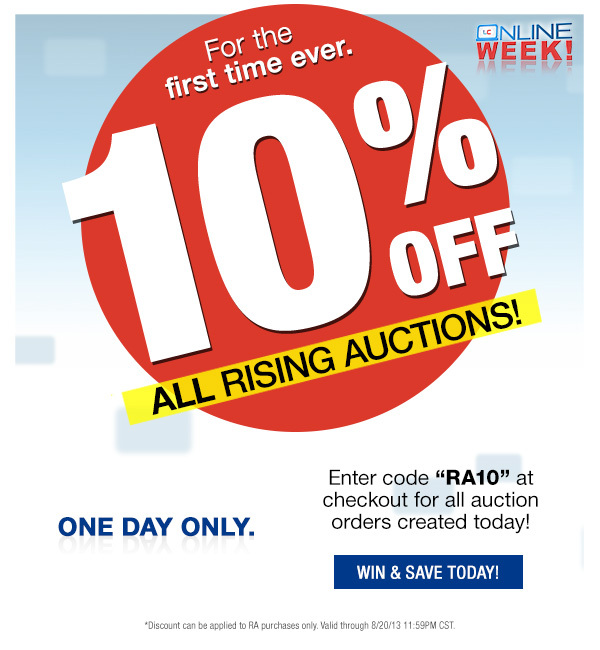 For the first time ever, and ONLY TODAY, you can save 10% Off any and all of your Online AUCTIONS! That’s right, we said Online Auctions! Pay for any number of winning bids before Midnight CDT, and use the discount code “RA10” at checkout, and you’ll get 10% off each winning bid! It’s that simple! Just remember to pay for all of your items before the end of the day and use the discount code! If you haven’t started bidding in our Online Auctions, then now is the time to start!